Besides the basic knowledge from Panda Facts, here are more FAQs to satisfy your curiosity about this enchanting creature. Are there any other names for the giant panda? 'Panda' we usually say refers to the giant panda, Ailuropoda melanoleuca. It is called xiong mao in Chinese (bear cat) and mao xiong (cat bear) in Taiwan area. Since it belongs to the bear family, it is correct to call it cat bear. On the other hand, it has been historically regarded as 'bear cat' in mainland China.Other names include bamboo bear, mottled bear, spotted bear, etc. Why is this creature so precious? It is an endangered species. These factors increase the rarity: reduction of natural habitats due to deforestation, mining and pollution; occasional illegal poaching and fur smuggling; small chance of having offspring and a minimal survival rate; bamboo flowering. When did the giant panda appear in the earth? Their ancestor is Ailuaractos lufengensis, also called primal panda that lived several million years ago. The main species evolved in central and southern China, then into further areas. The zenith of the giant panda falls between 500-700 thousand years ago. How can giant pandas live only on bamboo although they have internal organs of carnivorous mammals? They have a shorter intestine, which is quite different from other carnivores. According to the DNA analysis, there are seven unique species of bacteria that can help them digest fibers. These can not be found in other carnivore mammals. Are they forced to eat bamboo? This saying makes sense to some extent. The scientists believe that are growing population and activity of human beings forced them to move to highlands. They used to be carnivores a long time ago and later choose to eat bamboo to avoid hunting competition with black bears. What kinds of bamboos are most favored by giant pandas? Cold hardy bamboo, Thorny Bamboo, bisset bamboo (Phyllostachys bissetii) and umbrella bamboo (Fargesia robusta). Do they eat meat any more? If you feed them meat, they will still eat it. However, they will not leap to hunt. Besides bamboo, captive giant pandas' food also includes milk, eggs, vitamins, apples and maize bread. Why do they look so lazy? Although they will eat on average of 20 kg of bamboos every day, they cannot gain much nourishment. They can only digest about 17% of the food even with the special bacteria unique to them. They wander slowly to conserve strength. Yes, they can swim and it is an important skill for him to escape from their enemies. Although they look cuddly, pandas are classified as a savage beast, like tigers and lions. They are not as compliant and mild as they look. They will not rear up to give active strike, but once they do, they will bring great harm with their big sized body, teeth and claws. What is their strongest sense? They have poor eyesight and are born myopic, but they have very good olfactory and auditory senses. Which international sports games choose the giant panda as their mascot? 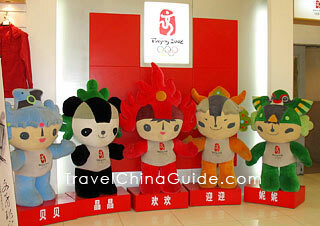 Two famous ones: 'Pan Pan' of the 11th Asian Games and 'Jing Jing' of the 2008 Beijing Olympic Games. Are there any volunteer programs for visitors to take care of them? Yes, Bifeng Gorge Panda Base and Chengdu Research Base of Giant Panda Breeding have volunteer programs. For the latest news, check the official notices of these two organizations. What are the best hours to see captive giant pandas? They are lazy outside morning hours, especially in summer. It is best to see them in early morning. They are most active around 9 a.m.., so it's better to go there before 9:30 a.m..
What is a panda census? It is a survey of panda population, distribution, and habitat status also. The outcomes of the survey will help effectively guide the future strategy for panda conservation. How do you count them in their natural habitats during a survey? It is an estimated number through comprehensive analysis: pandas seen in the forest, sizes of bamboo-bites in feces, home range, informational from local people and other signs. I didn't find any official contact information of Wolong volunteer program. But I recommend you go to Dujiangyan Panda Base which offers a special program allowing visitors to get close with these lovely pandas as volunteers. If you are interested in this program, you can send email to pandaeducatecenter 163.com to make a reservation or you can call the base at +86-28-69290315. 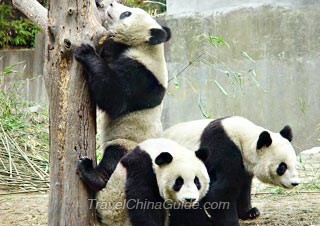 Besides, I know TravelChinaGuide also offers such kind of panda volunteer tour packages, which might help you make the panda volunteer program comes true. How can I make a donation to this organization? If you would like donate for lovely giant pandas, Chengdu Giant Panda Breeding Research Foundation may help you. Their email address is pandafoundation panda.org.cn and you may contact them for details. When you volunteer for the day, you mentioned feeding the Panda's...are you interacting with them or just putting food down for them? 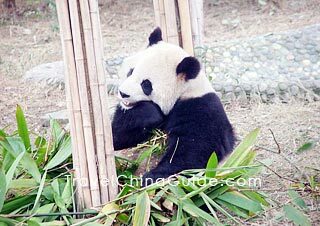 Now the volunteer program is only available at Chengdu Bifengxia Panda Reserve Base. Generally, the volunteer work refers to the cleaning of the panda house and helping the staff to prepare the food for the pandas. You will need to follow the staff's instruction. You may have no chance to have a close access to the pandas. Do you mean the Giant Panda Base in Chengdu? If yes, the wheelchair is accessible in the scenic spot. Thank you. I would like to have my photo taken with a panda if that option still exists. I hope to come at the end of August. My wheelchair that I use a very light and small. As far as I know, the activity of holding a panda is not available at Giant Panda Base in the city. 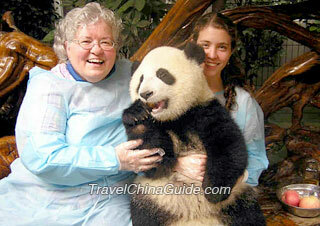 If you want to hold pandas and take photo with them, you can visit the Dujiangyan Panda Base. As long as you do not visit there during chinese holidays, it won't be crowded. Otherwise, you can buy the tickets online.